We will assign our entire crew to your commercial roof replacement job in Angus, ensuring that your building is our only priority. The roof on your commercial building serves a number of important purposes. It protects the interior from moisture damage, as well as cold and hot air as the temperature shifts, and prevents pests from coming into the space. Roofing materials aren’t made to last forever, which means you’ll have to replace the roof on your commercial structure at least once every 10-15 years, depending on what style of roof you have. Many commercial roofs are made of shingles, which can wear down over time and allow air and moisture to seep in. 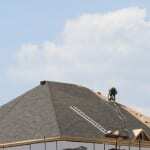 When the time comes to replace your roof, contact us at Slippery Slope Roofing to get a free estimate. Our commercial roof replacement services are available to customers in and near Angus, Ontario. Something that sets us apart from other roofing companies is our commitment to each individual customer. We will assign our entire crew to your commercial roof replacement job, ensuring that your building is our only priority until it’s complete. This also allows our team to keep up with cleaning the roofing materials and supplies as we go, so disruption to your commercial building is limited. When we perform a commercial roof replacement service, we start by removing the old materials and replacing the waterproof barrier to prevent moisture from seeping into the structure. From there, we will install the new shingles with precision and care to maintain the manufacturer’s warranty on the roof. Our team also provides a 10-year warranty on workmanship, giving you the peace of mind that your roof will be able to protect your building and employees for many years to come. At Slippery Slope Roofing, we offer high-quality commercial roof replacement services in Angus, Barrie, Orillia,Bradford, Alliston, Newmarket, Midhurst, Cookstown, Beeton, Innisfil, Collingwood, Wasaga Beach, Oro-Medonte, Midland, New Tecumseth, Clearview, Bradford, Essa, Stayner, Springwater, and surrounding areas of Ontario.